Dr. Anderson joined the Koch Institute in 2011 and is also Associate Professor of Chemical Engineering and of Health Sciences and Technology at MIT. He received a BA in Math and Biology from the University of California at Santa Cruz and a Ph.D in Molecular Genetics from the University of California at Davis. He worked in the laboratory of Professor Robert Langer at MIT from 2003 as a postdoc and later as a Research Associate. He has over 280 papers, patents, and patent applications. These patents have led to a number of licenses to pharmaceutical, chemical, and biotechnology companies. Our research is centered on developing new materials for medicine. We pioneered the use of robotic methods for the development of smart biomaterials for drug delivery and tissue engineering. 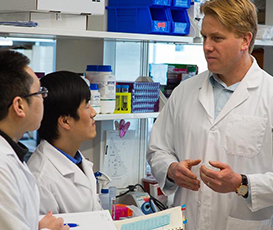 Our lab has developed methods allowing rapid synthesis, formulation, analysis, and biological testing of large libraries of biomaterials for use in medical devices, cell therapy and drug delivery. One particularly important problem is the quest to develop nanoparticles that support the therapeutic delivery of drugs and macromolecules, inside of specific cell targets, in vivo. The advanced drug delivery systems we have developed provide new methods for nanoparticulate and microparticulate drug delivery, non-viral gene therapy, siRNA delivery, and vaccines. Our research is centered on developing new materials for medicine. One particularly important problem is the quest to develop nanoparticles that support the therapeutic delivery of drugs and macromolecules, inside of specific cell targets, in vivo. There are many macromolecular drugs, such as DNA, RNA and some proteins, with great therapeutic potential that will only function when inside of a cell. Furthermore, many drugs are non-functional or even toxic if they do not get delivered to the correct cell-types in the body. The rational design of nanoparticulate drug delivery systems is often challenging, particularly when the design criteria are difficult to define. To address this challenge, we have developed fully automated, combinatorial systems for the synthesis, purification, characterization, and formulation of new biomaterials and nanoformulations. Materials identified using these approaches have shown great utility both in vitro and in vivo, including in non-human primate studies. We continue to focus our efforts towards developing next generation nanotherapeutics for cancer and other diseases, and to develop an understanding of the structure/function relationships between nanoparticle structure and biological activity. A full list of Professor Anderson’s publications can be found on PubMed.